Beach Slang’s acclaimed debut The Things We Do To Find People Who Feel Like Us was a catalog of the trials and tribulations of youth. Eleven months later, frontman James Alex, a father in his 40s, seems to have acknowledged that he’s grown up some. True to its title, sophomore record A Loud Bash Of Teenage Feelings maintains heavy reverence for those emotionally jumbled salad days, but approaches the subject from a perspective of nostalgia and observation rather than contemporaneous experience. The themes that drove confused and rebellious kids to Beach Slang haven’t gone anywhere; inspired by his past and stories of fans Alex talked to on tour, the album is part reminiscence, part empathy, part advice. He retains a sincere and lasting understanding of the frustrations of the young outcast, and works that angst into tracks such as “Punks In A Disco Bar,” a brash, vigorous banger that surges on a saturating pop-punk riff and assures his audience that they’re not alone. Meanwhile, in stormy cut “Atom Bomb,” those who are “tick, tick, ticking” with a pent-up blend of rage, unease, hopelessness, and desire get a turbulent, visceral release. 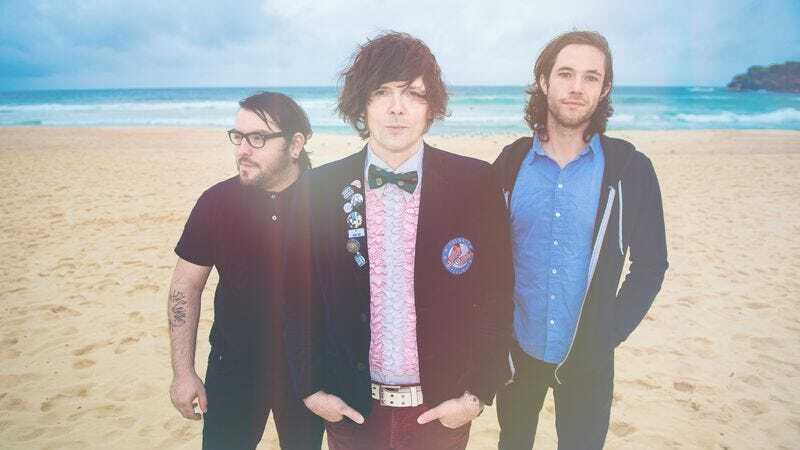 Beach Slang maximizes the cathartic effect of these mini-anthems (everything’s wrapped up in a brisk half-hour) by making them more loud, raw, and forceful than ever before. The gritty Psychedelic Furs-meets-screamo vocals are a heavily distorted, growling mess; a thick blanket of fuzz smothers the frayed guitar riffs; the tracks swiftly smash into each other in a sonic demolition derby. Though there isn’t much time to catch a breath, slickly catchy pop songs such as “Spin The Dial”—“I’ve got a halo on my heart” is its earnest refrain—transition to vibrant moments of reflection. A Loud Bash Of Teenage Feelings carries a message to Generation Z: Persevere while holding onto those chaotic passions, with the band’s members themselves as the example that it can be done.